Orli Shaham surrounds these masterworks with compositions that specifically inspired the romantic master: works by J.S. Bach, Chopin and Schumann. Her commitment to living composers led her to commission Avner Dorman and Bruce Adolphe to compose works purposefully influenced by Brahms. As luck would have it, Australian composer Brett Dean’s recent Hommage à Brahms für Klavier, fits neatly into this collection. This is Orli Shaham’s second commission from the young Israeli-American composer Avner Dorman; the first was in 2010 for the Hebrew Melodies collection she recorded with her brother, the violinist Gil Shaham. She gushes about Dorman’s After Brahms, describing it as “ingenious, sensuous, and powerful.” Orli’s admiration for Bruce Adolphe began when she was a student in his theory class at The Julliard School, “Adolphe’s voice as a composer and as a theorist, with his deep understanding of how composers put together great music, makes him the perfect compliment for this Brahms project”. This release also includes the world premiere recording of Brett Dean’s Hommage à Brahms für Klavier. Written for pianist Emmanuel Ax, Dean conceived the work as three interludes to be played between Johannes Brahms’ Three Intermezzi Op.119. Orli’s love, affection and understanding of Brahms pervades this recording in abundance. The recording opens with Brahms Op.118, the A minor Intermezzo full of bravura and confidence the torrent of arpeggios getting the recording off to a flying start. The Chopin, Schumann and Schubert offered here from Orli displays, what is an enviable technique, to perfection – the delicacy of touch is clearly evident, along with her ability to carry and sustain melodic line and shape, a technical facility many pianists can but dream of, her powerful gift of intimacy ever drawing the listener in. 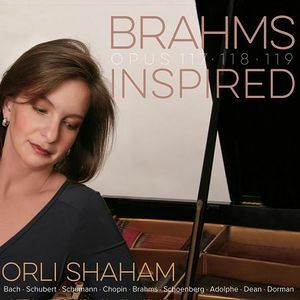 Orli Shaham is renown for commentary during her concert performances, talking audiences through her concert programmes, but here the listener can hear that every work recorded is meant: Adolphe’s My Inner Brahms, follows Brahms’ Op.118, No.6 on CD1 as Adolphe’s work draws it’s theme from this. There is no other place on the recording for Dorman’s 3 Intermezzos than to open CD2, the impact of his Allegro con moto demanding attention, his 3rd Intermezzo amazingly Bachian in approach, setting up nicely Partia No.1 which follows. Brett Dean’s Hommage à Brahms nestles beautifully into Brahms’ Op.119, the Australian composers voice clearly evoking a style and approach of Brahms, but with very much his own and distinctive contemporary voice.